Skyline snapped en route from airport. The pull of the Pacific Northwest grew gradually but inexorably over the years. When my son moved out there six months ago, there no longer existed a single excuse not to just… GO. Seattle to (almost) Sacramento and back again in 2.5 weeks. Another epic journey undertaken with my 24 year old daughter, Maggie. 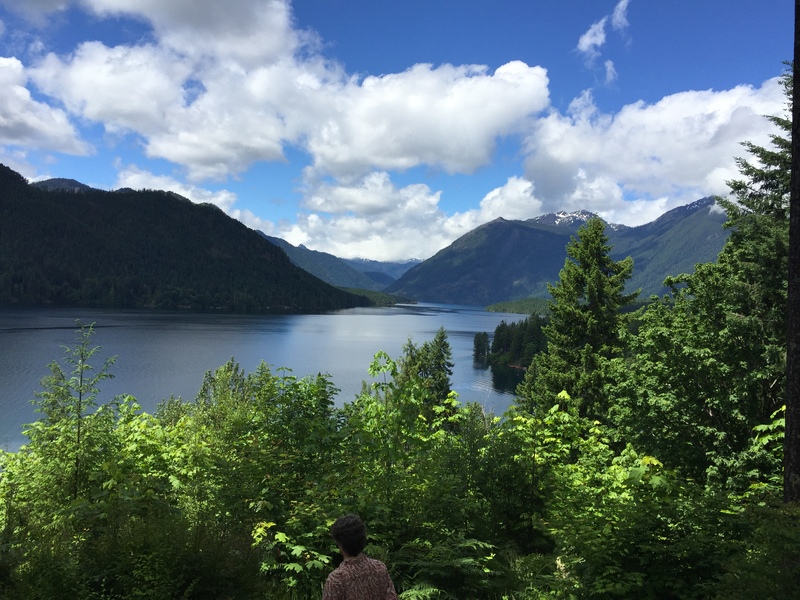 In this overview (Part I) — Washington State. If you told me tomorrow that I was moving there, had a job, a place to live, and sorry but it just had to be, I’d kiss you. 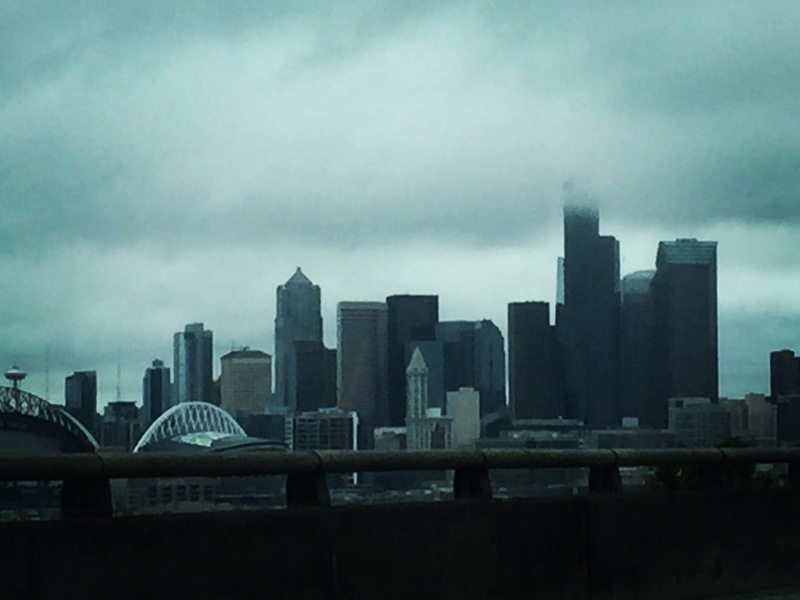 Seattle stole my heart and the whole state captured my spirit. 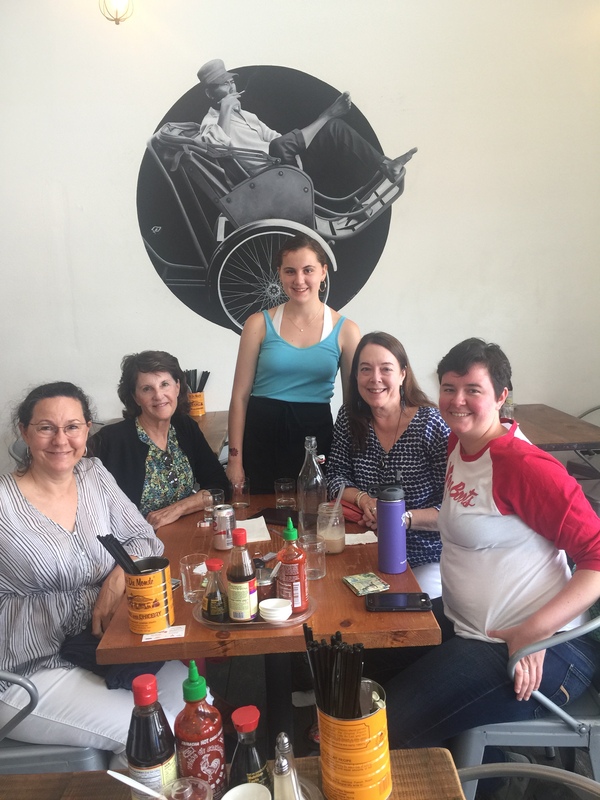 Seeing a dear friend from my school days in NYC and her wife, and getting the quickie overview of Seattle from a wise and pragmatic person who instinctively knew what we’d love. The wonderful Anna and Louise. 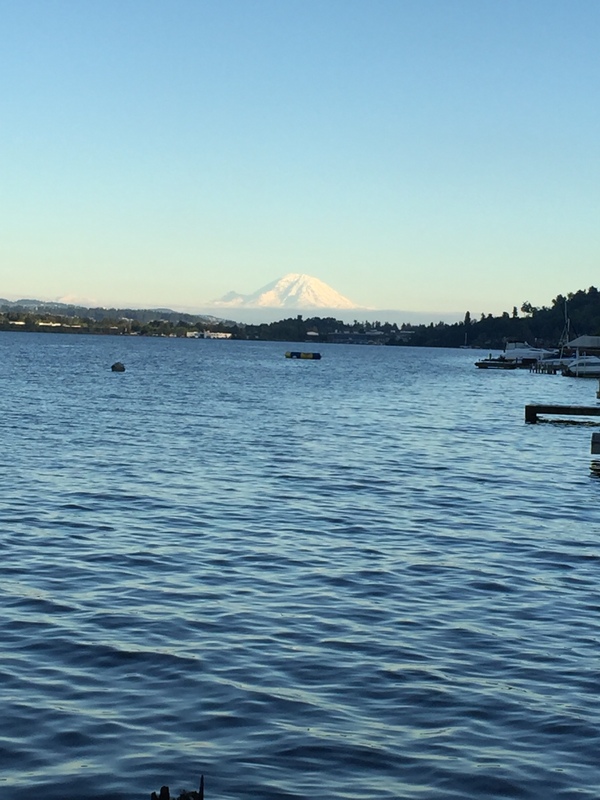 Lake Washington and Mt. Ranier. 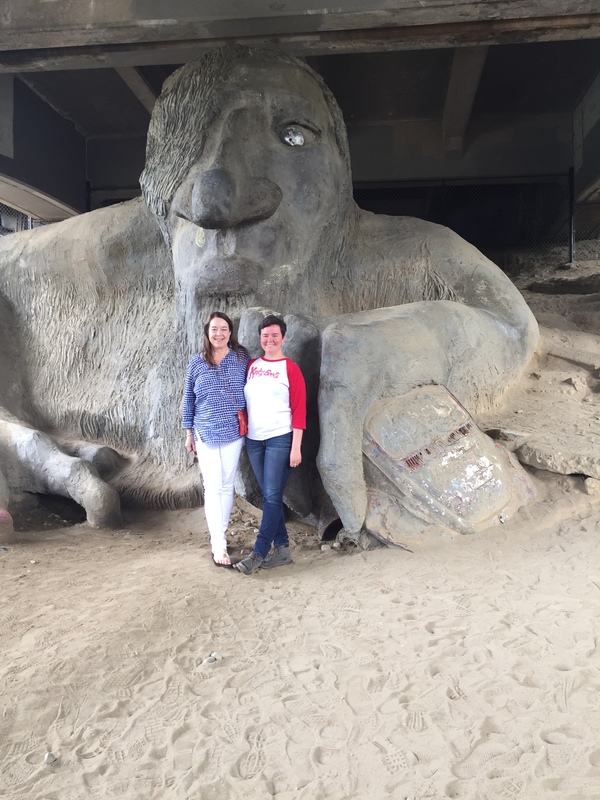 The troll under the bridge. Yes! A glorious art installation and he even holds a real live VW bug in his trollish grip. Lenin-in-mid-stride. 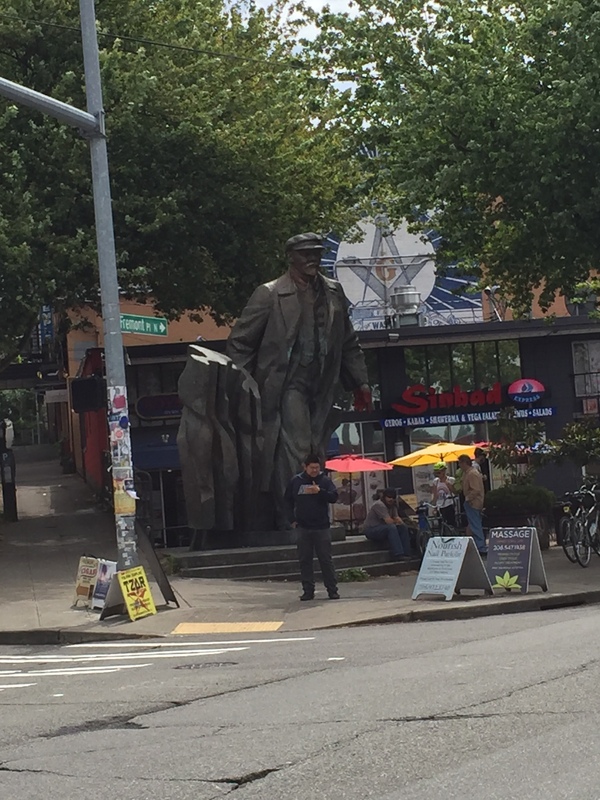 Someone thought it was a great idea to buy an old statue of the leader of the Communist Revolution from the Russians and install it in front of a café. He makes an impression in any city. The Olympic Sculpture Park (part of the Seattle Art Museum). 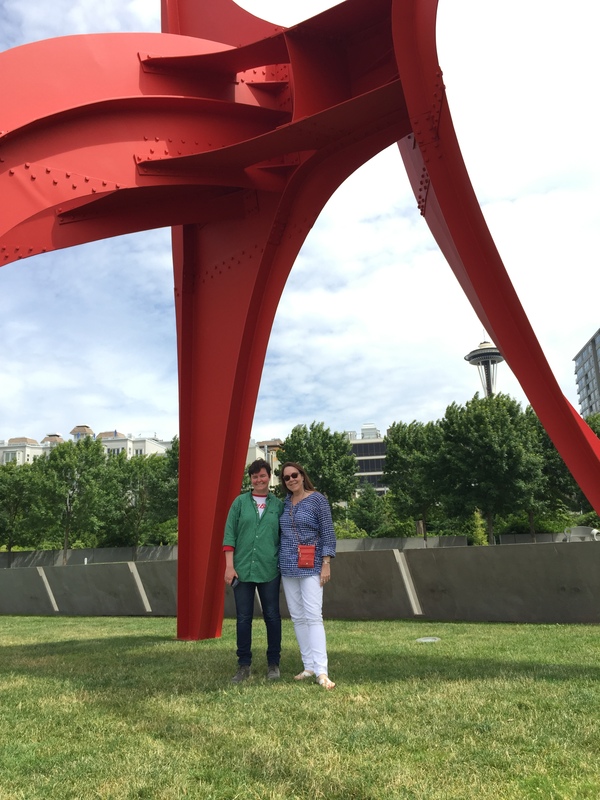 Set on the water, artists like Alexander Calder (in all his majesty), Richard Serra (whose amazing work is at Dia Beacon in my neck of the woods), my old fave, Louise Nevelson, and many more, are on fabulous display. 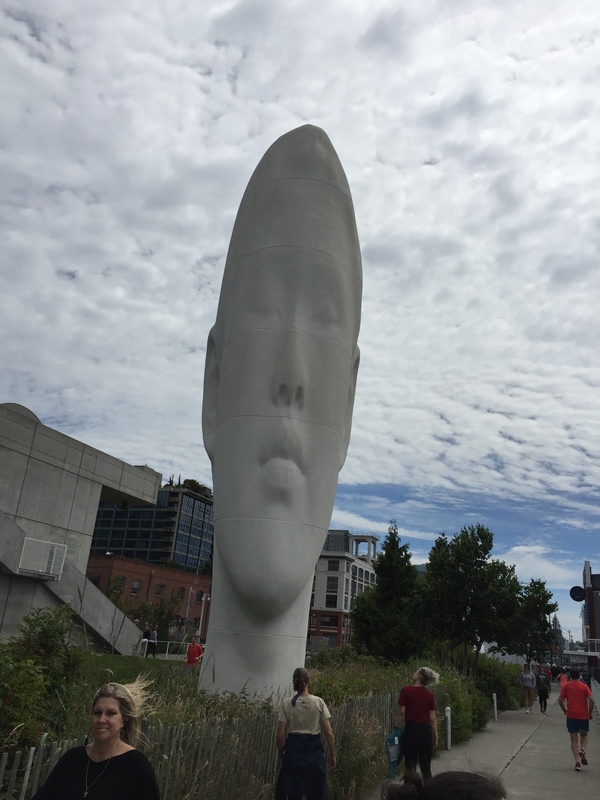 One artist new to me, Jaume Plensa, knocked my eyes out with his monumental Echo…. 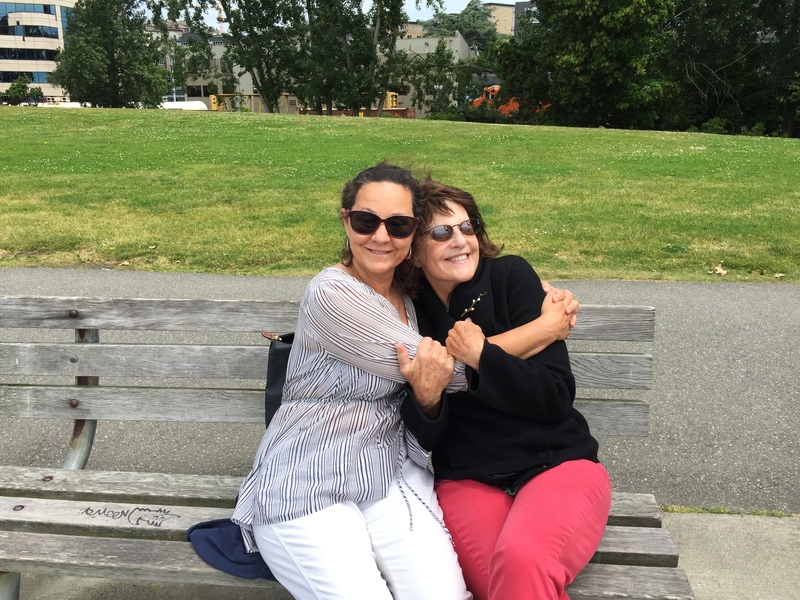 We walked together in the sun and the breeze, wearing light sweaters in late June. Bliss. The salmon ladders. If you’ve never heard of such a thing, you’re in good company. It was new to me, too. 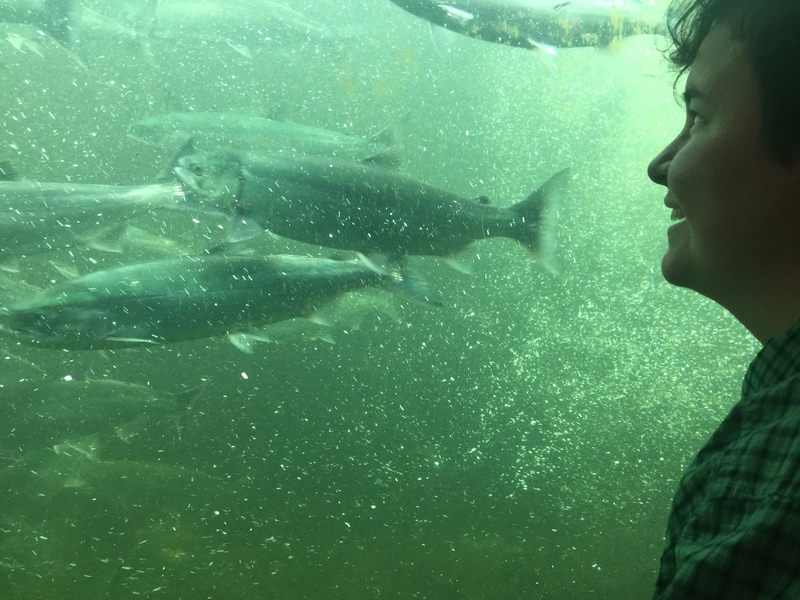 Ladder is a misnomer, really, as the engineering is more about stair-steps that head upstream through gateways, so the salmon can access their spawning grounds despite the existence of a lock system that controls water flow into and out of the giant Lake Washington. 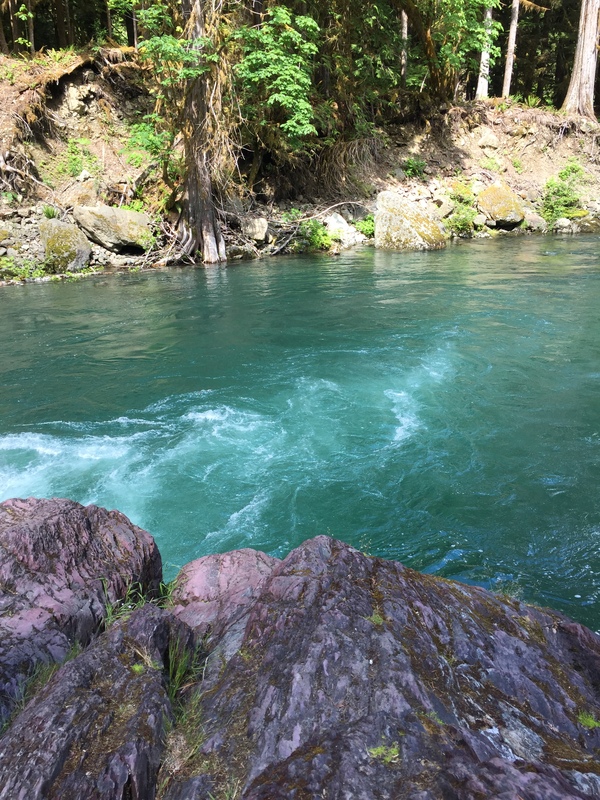 There is a viewing spot below ground-level where we could watch the valiant wild salmon swim against the current, find the gateway to the next level, and use their muscular little bodies to push through it. They were beautiful and Maggie and I were thoroughly transfixed for a good hour. And yeah, we took about 9 million photos and at least 8 thousand video clips. We were inspired. The salmon in the ladders. The first five or so of a plethora of small coffee spots we stopped at during our trip. My friend, Anna, understood that we needed to see multiple “temples of coffee” as she called them. 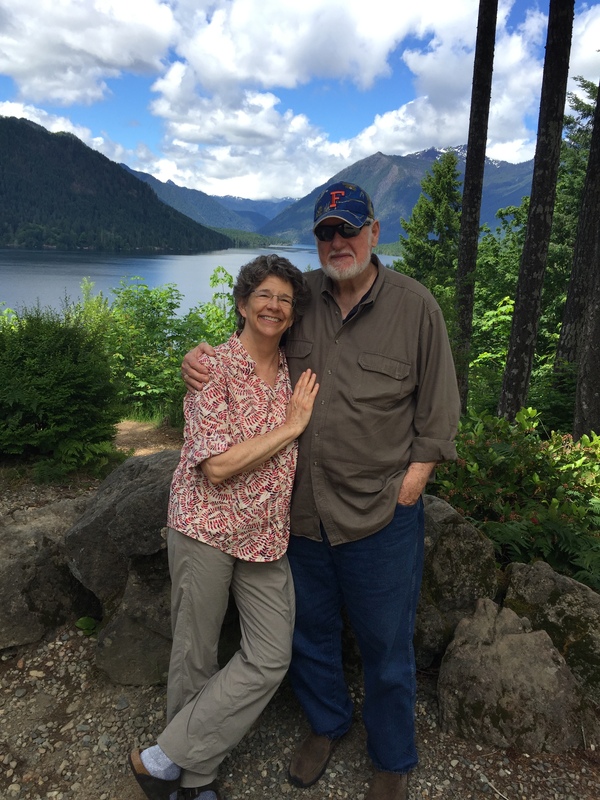 Visiting friends, Tom and Nina, in Olympia, WA and experiencing their love and wonderful tour-guiding. 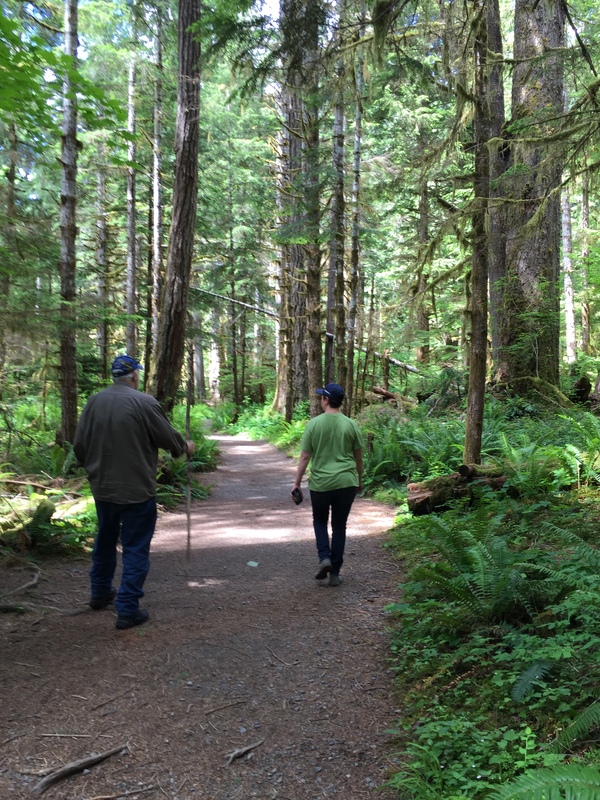 Walked through part of the Olympic National Park. Since the park is about 1400 square miles, we were on just a microscopic fraction of it, but what we saw filled our eyes and souls with great beauty. 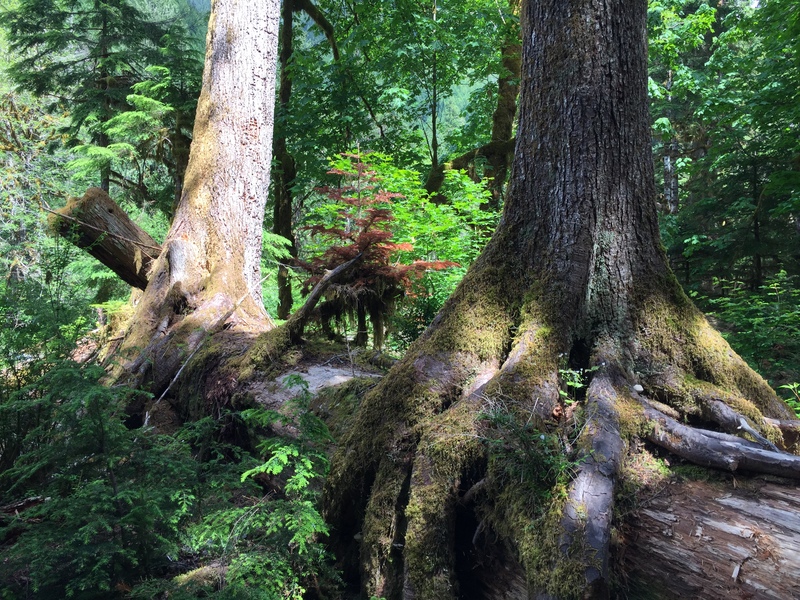 A temperate rainforest covers most of the park, and we walked what is called the “staircase” trail, which starts about an hour and a half from Olympia. Majestic cedar trees, Douglas fir, Sitka spruce, and hemlocks towered overhead. Sunlight filtered through the canopy, but we were cool and comfortable as we walked. 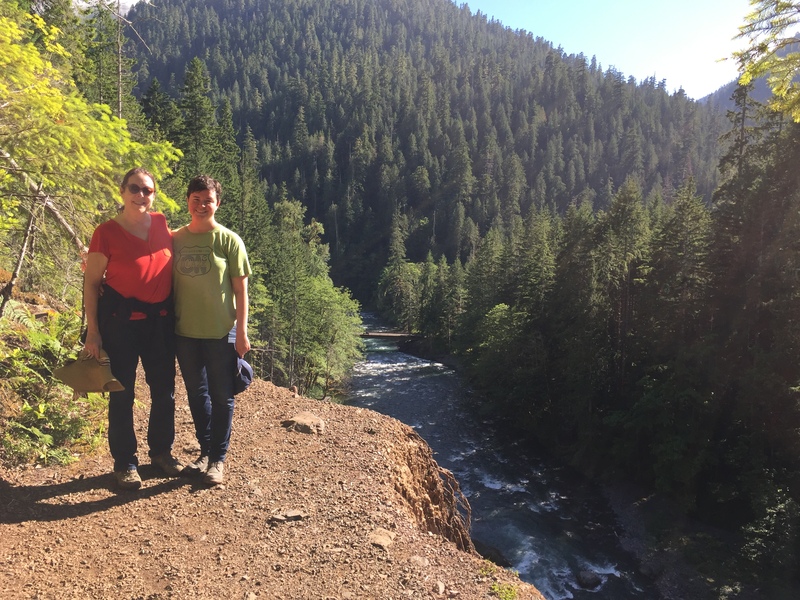 We stopped frequently to inspect a fern, some moss, a section of rapids, or a fallen cedar (one was especially enormous; the root system, lying on its side, towered over us). 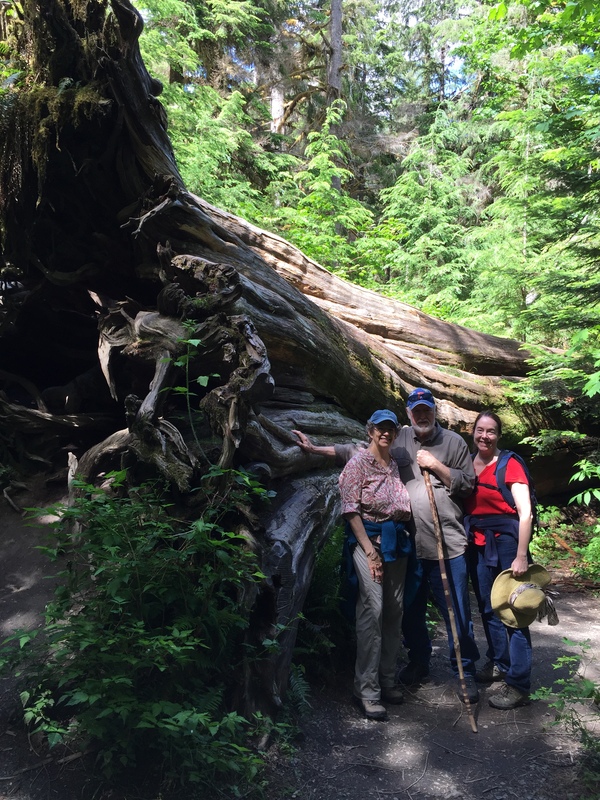 Tom, Nina, and me posing beside the huge fallen cedar. One of our hiking companions, Tom, is 81 years old. He impressed all of us! Beautiful couple and a beautiful view. Tom and Maggie walk ahead. Trees grow on other “nurse” trees. 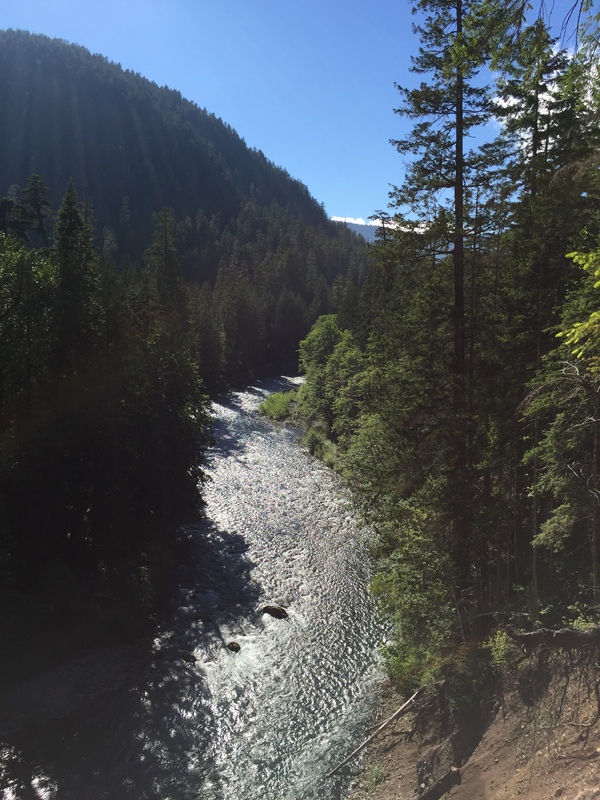 The Skokomish River from up hgih. 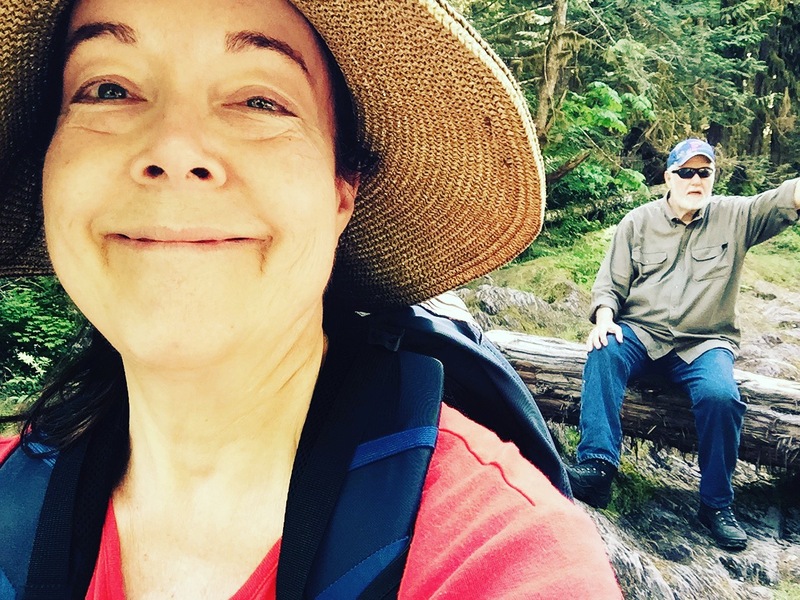 Taking a rest as we walked the Olympic State Park Staircase trail. 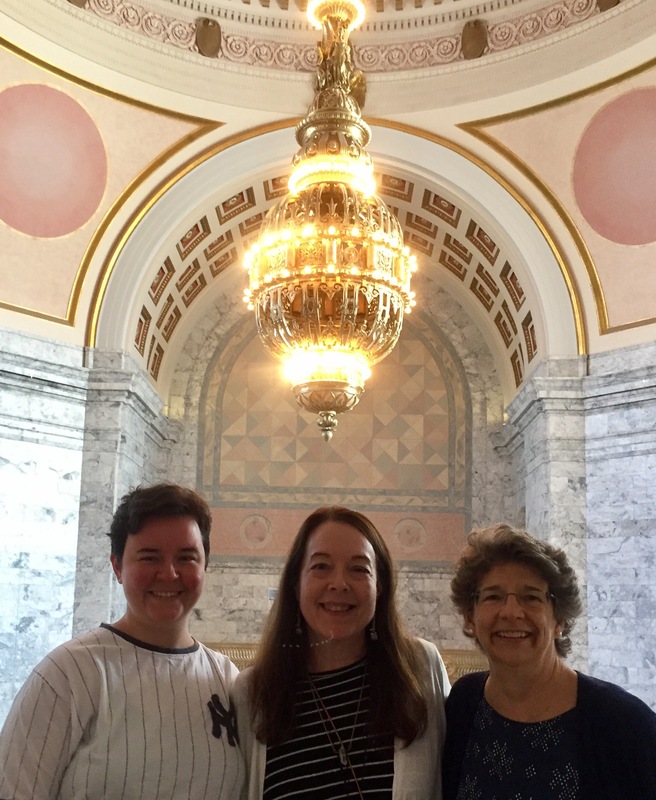 Toured the Capitol building in Olympia, WA. To be honest, many capitols in this country were constructed with ugly in mind. Or maybe it was just economy. But this building and all the ones around it are modeled on the neoclassical style of the nation’s capitol. 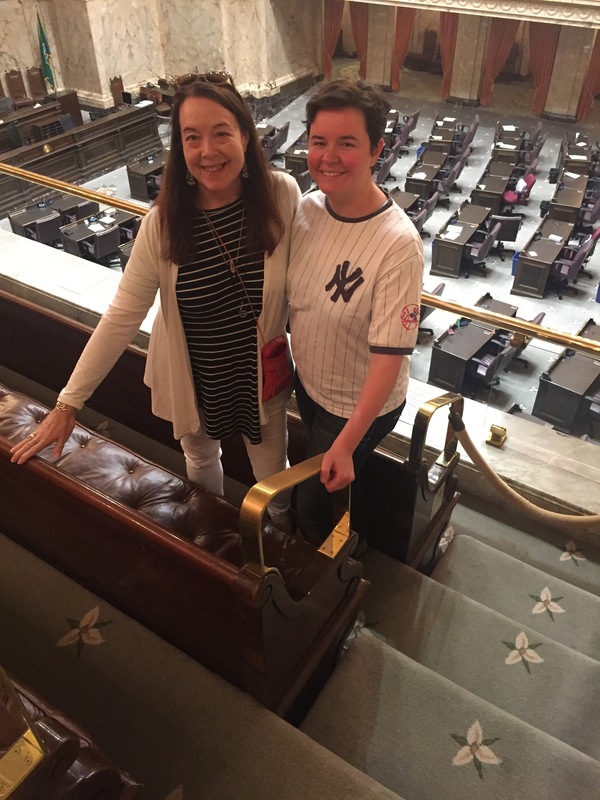 The capitol itself was not only quite gorgeous, but contained more marble than I’ve seen in one place outside maybe the Metropolitan Museum. Fun fact: the supreme court of Washington is comprised of five women and four men. Seems about right. A VW bug would fit in that chandelier. Ate more delectable salmon. Plus some crazy-good chicken Perloo made by Tom, a Florida Cracker born and bred. Washington State secured itself in me as a destination of my heart. 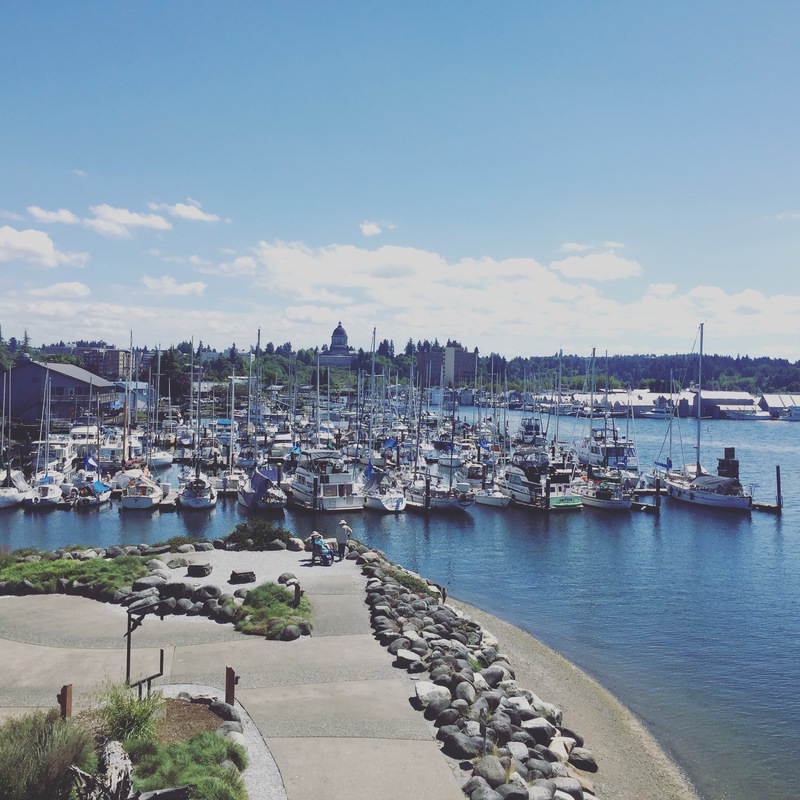 I constantly imagined myself living there and began fantasizing possible move-to-Seattle outcomes for myself. It’s probably a good idea for me to visit in the winter and really experience the daily rain I don’t think I’m going to mind, but won’t really know till I see it firsthand. 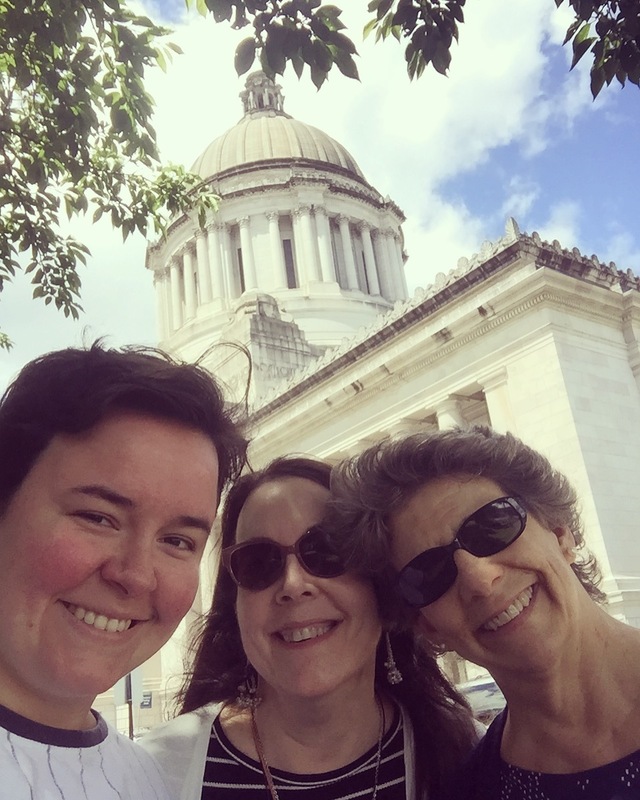 Olympia is a port city. Next installment: heading south through Oregon to meet up with firstborn, Win, in CA.